Pilanesberg Game Reserve is 50 000 hectares in size and is located in the North West Province of South Africa, 150 km north west of the Gauteng metropolis and 60 km north of Rustenburg. 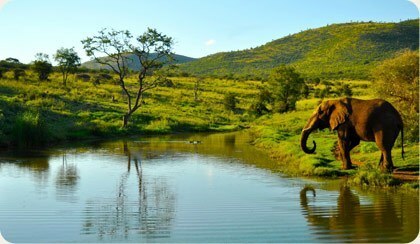 The history of Pilanesberg Game Reserve is also unique amongst national parks in Africa. Pilanesberg National Park's special features of rugged landscape, well-watered valleys and attractive dwelling sites have made it a preferred site for human settlement for thousands of years. Prior to its proclamation as a reserve in 1979, the Pilanesberg National Park Complex was degraded and depleted of indigenous game populations due to fairly intense settlement by commercial farmers. At considerable expense, the land has been restocked with game, the scars of human settlement were removed and tourism infrastructure was developed during the first 15 years (1979 and 1993). This constituted the largest and most expensive game stocking and land rehabilitation project ever undertaken in any African game reserve at the time. A 110 kilometer peripheral Big Game fence was erected over some very rugged terrain, 188 kilometer of visitor roads have been developed and more than 6 000 head of game were introduced during the Operation Genesis game trans-location program. Thus, while wildlife resources are rapidly declining in most developing countries in Africa, Pilanesberg National Park is one of the few areas where this trend has been dramatically reversed. For this far-sighted action the North West Province (Previously Bop Parks) and its people have received worldwide acclaim and recognition. The challenge that lies ahead is to further develop and manage Pilanesberg National Park in such a way that the conservation, cultural, recreational and economic benefits of this far-sighted action can be optimally utilised to the benefit of current and future generations.